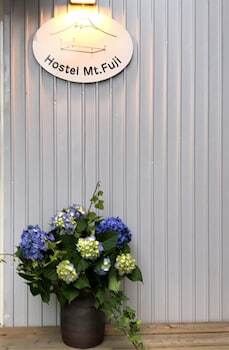 With a stay at Hostel Mt. Fuji in Fujikawaguchiko, you'll be a 5-minute drive from Mt. Kachi Kachi Ropeway and 8 minutes from Itchiku Kubota Art Museum. Featured amenities include luggage storage, laundry facilities, and coffee/tea in a common area. Limited parking is available onsite. With a stay at this vacation home in Kyoto (Central Kyoto), you'll be within a 15-minute drive of Nijo Castle and Higashi Honganji Temple. With a stay at Guesthouse Taikoya – Hostel, you'll be centrally located in Kyoto, within a 10-minute drive of Nijo Castle and Kyoto Imperial Palace. When you stay at Kitayuzawa Mori no Soraniwa in Date, you'll be steps from Kitayuzawa Onsen. A train station pick-up service is provided at no charge, and free self parking is available onsite. With a stay at Hotel Route-Inn Obihiro Ekimae in Obihiro, you'll be a 4-minute walk from Kita no Yatai and 10 minutes by foot from Obihiro City Office.